If you're like most of your peers, you probably encounter your fair share of distractions in the workplace. Luckily, there are ways that you can manage them. In the information age that we live in, attention is one of the most precious resources a person has. Traditional advertisers, online companies, and device manufacturers fight hard for every millisecond of a consumer’s attention. At a workplace, frequent distractions are one big productivity killer. On average, it takes 23 minutes to resume interrupted work every time you switch contexts. Rapid context switching is not only costly time-wise but also causes stress and anxiety stemming from that feeling of constantly trying to keep up with an incessant stream of information and assignments. However, let’s admit it: Distractions are a reality of the modern workplace. We can’t completely eliminate them, but we can manage them better in order to increase productivity in the workplace. Below are some tips to help lower the net cost of distractions in a workweek, as well as some effective hacks for getting back on track when running out of steam. Having a ton of assignments can be overwhelming, but you can only do so much each day. Cut the unnecessary distractions by committing to accomplish the critical items for today and ignoring tomorrow’s items. Use a legal pad, your favorite to-do app, or even a plain text file, and write the items on your mind. Mark the items that are critical for today. Give the tasks a rough time estimate. Now, look at the list and determine what you can realistically do today (be conservative). That’s your final list. Repeat the procedure tomorrow. 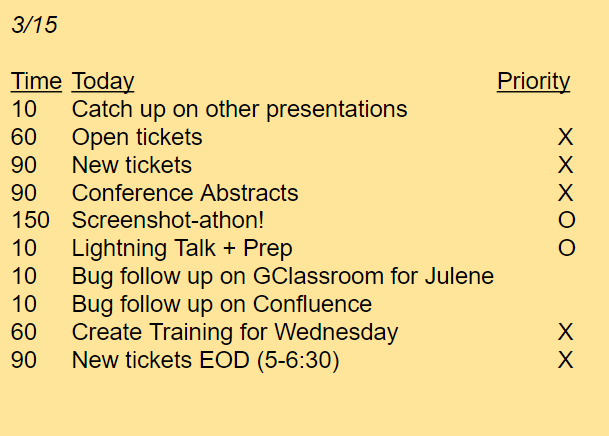 Daily task sheet example. Legend: X – critical tasks, O – scheduled meetings, blank – regular priority. She selects six critical items from her backlog, marks events that need preparation, and timeboxes each item. Items that don’t make the cut stay on the backlog until morning review. New items from the day are marked critical or placed on the backlog with the rest. The reason this technique works is because once you mentally commit to specific things to work on today, you will be less tempted to derail your work. In addition, having a clear agenda helps reduce that agonizing feeling of endless tasks that you can never keep up with. It's worth noting that this routine must be kept simple. Your daily task sheet should always be visible, clear, and free of any unnecessary details that could steal the attention. I would strongly advise against sophisticated task list apps. A simple flowchart for managing distractions. Often, the simplest systems are the most powerful! Another tool that I really like is the Pomodoro technique. I use it to get back on track when I find myself context switching too much, which can lead to a burnout. 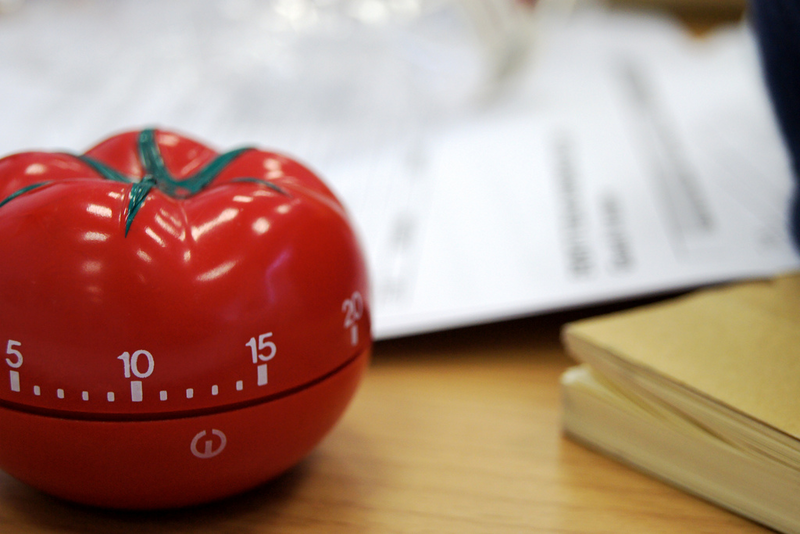 Essentially, Pomodoro is an exercise to break down work into uninterrupted intervals (called Pomodoros, usually 25 to 30 minutes in length) separated by short breaks. Decide on the task to be done, set the timer, and work just on that task until the timer rings. If a distraction pops into your head, write it down and immediately get back to your task. Take a short (three to five minute) break between Pomodoros. Take a longer break (15-30 minutes) every four Pomodoros. You’ve stayed on top of your emails, responded promptly to random requests from coworkers, and attended all the meetings you had to attend. However, you’ve yet to make meaningful progress on that bigger project with all the other things going on. Move as many meetings as you can to a single day (call it your meetings day) to free up the rest of the week. Now, put on your calendar a few big chunks of time for uninterrupted work (two hours or more) where you will focus on larger tasks. When the time comes, go into a quiet room (and let your teammates know), shut down your chat app and other sources of notifications, and take that one-on-one time with your project. 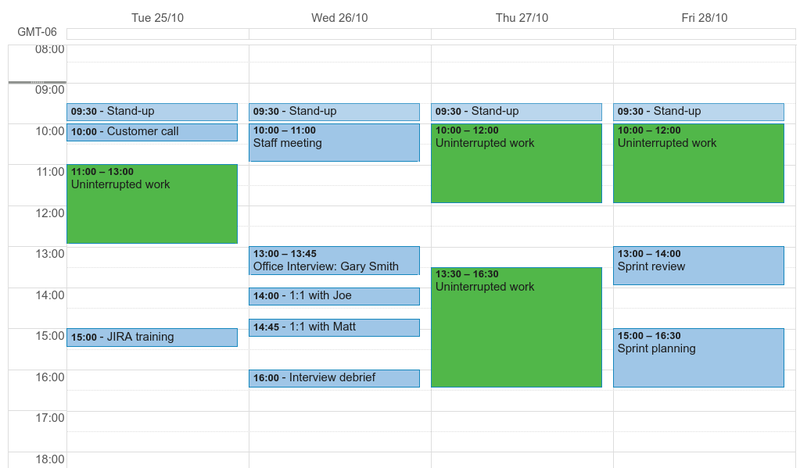 A simplified version of my average week, showing slots of time allocated to uninterrupted work. Sometimes a physical change can be a cue to clear your mind and refocus. Move to a couch for a couple of hours. Step outside and go for a short walk. Work from home for part of the day, if you can. Use an available huddle room. 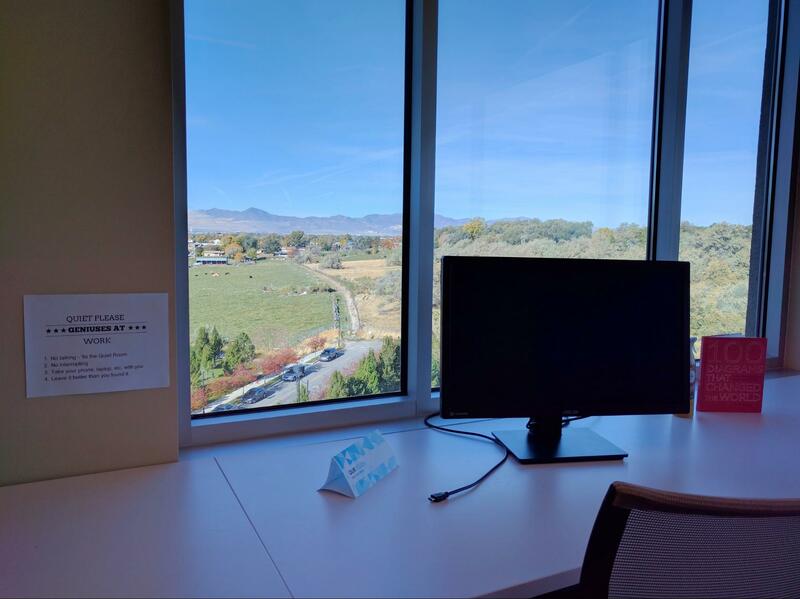 At our office, we also have a special Quiet Room where people can escape noise and distractions and enjoy a beautiful, unwinding view from the window. The Quiet Room: A refuge for the distracted. Build a tent! When you’re desperate, anything goes! What are your favorite tips to manage distractions at work and increase your productivity in the workplace? Leave a comment! Published at DZone with permission of Dmitry Pashkevich , DZone MVB. See the original article here.